Email newsletters can be a great way for many businesses to keep in contact with customers and prospects. 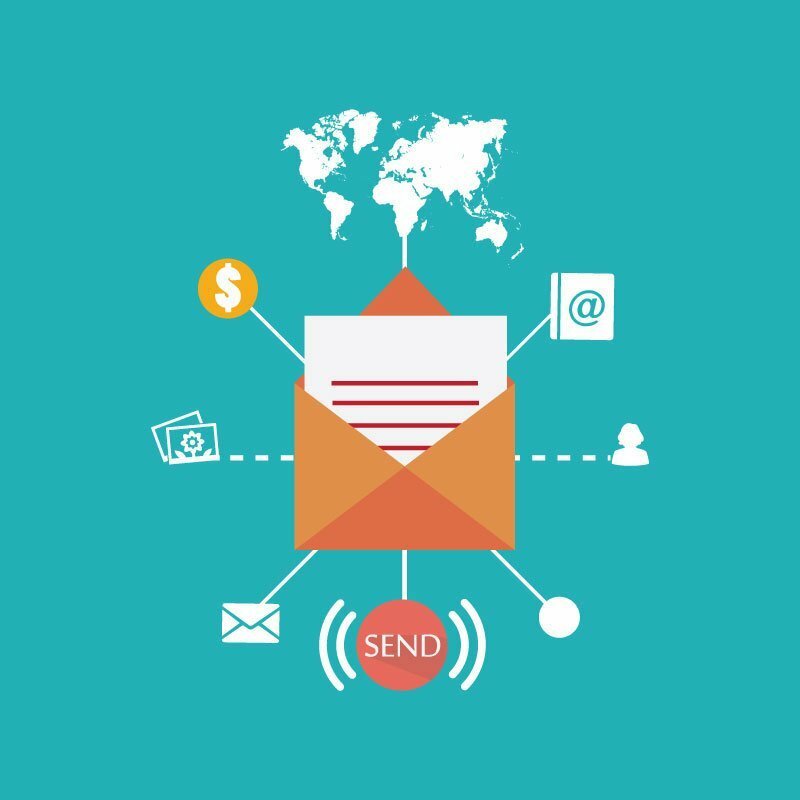 A great email newsletter design leads to higher click through rates and subscriber retention rates. In this post we are sharing tips on how to use your email newsletter design to reinforce your brand and create a positive experience for your readers. Who are you sending this email to and why are you sending your readers an email? Identifying what you’ll be giving them back in return for receiving their email address is very important. The more value you are providing them with through your email newsletter, the more they’ll click through your newsletter and keep subscribed to your list. But, get right to the point with all the updates that the reader needs to know about and leave the rest to your website. We all scan text. In our distracted environments, we glance at our phones, our laptops, and look all around. Instead of reading your email exactly word-for-word, your readers will scan. So it’s not the best to include your offering at just the bottom of your page. Having multiple touch points in your email newsletter allows readers to access an offering at different points that their eyes hit the newsletter. Plus, there are multiple ways to get your reader to click back to your website. Also be mindful of your mobile readers! Keep links separated enough to avoid readers tapping on the wrong links. Contrary to some promotional practices, which suggest surprising people to keep them guessing, including a level of formality in your email newsletters is actually a good thing. Such things to include in an email newsletter template: company logo, general message layout and visual layout. Beyond the design layout, which can be achieved through creating an awesome email template, you might even consider different content sections for displaying new videos or blog posts. After you have a basic layout, now you can start thinking about color palettes, bullet styles, text colors and all the elements that create the “right look” for your email. Think about encouraging people to click on your links with clickable buttons. Larger buttons help the visual layout on a mobile phone for users to tap and takes up more visual space that just a normal hyperlink. Contrast is super important here as well. The creative look and feel of your email newsletter should create a positive experience for the user and ultimately align with a goal. Designing with a goal in mind might include using custom URLs on buttons or images and placing elements in optimal spots. What works for one business might not work for another. Whether you have a designer coding a custom email newsletter template, or a MailChimp template, using great visuals are super important. If you’re not that great at making visuals, be sure to check out sites like Canva or PicMonkey as free visual graphic editors. These are great tools that make it easy to turn pictures into awesome visuals without a high learning curve. Also, nobody wants to be labeled as a “spammer” by their readers. While there is certainly more to addressing email spam. Having a well designed email may discourage people from marking the email as spam. If you really want to focus on reaching mobile users, testing your email on multiple devices is going to help you design the best. Responsive design for emails depends on two things: the device that is being used and the application that is running in order to read the device. According to Litmus, responsive emails are supported by iOS Mail app, Android 4.X Email/OEM app, Windows Phone 7.5 and BlackBerry 0S7 + Z10. Responsive emails are not supported by: iPhone Gmail app, iPhone Mailbox app, iPhone Yahoo! Mail app, Android Gmail app, Android Yahoo! Mail app, BlackBerry 0S5, Windows Mobile 6.1, Windows Phone 7, Windows Phone 8. To understand which format you need to focus on, consider looking at an email client usage report. Some newsletter design programs such as MailChimp will show you how your newsletter looks on your client’s browsers and devices. In MailChimp you can run an inbox inspection and check the percentage of users across certain email programs. MailChimp will also provide screenshots of how your campaigns looks in some of the more popular email programs. If using MailChimp, click on “view email client usage” and you’ll get a break down of the percentages of your user’s email clients. Were they using a mobile device? What percentage of them still use Internet Explore? MailChimp can provide that information.